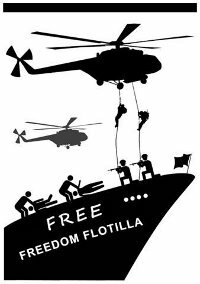 Israeli attack on Freedom Flotilla has very well proved that Israel does not value human lives let alone international laws but the well-wishers of Israel are silent on this issue as Israel undertakes another act of barbarism and continues to show its real face to the world. Israel Navy troops opened fire on pro-Palestinian activists aboard a six-ship flotilla carrying aid destined for the Gaza Strip before dawn Monday, killing at least 16 people and wounding several others, after the convoy ignored orders to turn back. The ships, carrying more than 700 passengers also included three Pakistanis namely, Talat Hussain, Agha Raza (Both of Aaj TV) and Mr. Nadeem(of an NGO, Khubaib, Islamabad) , along with representatives of 40 other countries, taking 10,000 tonnes of food, medicine and other goods to Gaza, which has been completely blocked by the Israelis since 2007. About six hours after the flotilla left waters off the Cyprus coast, three Israeli missile boats left their base in the northern coastal city of Haifa on a mission to intercept the ships. Television showed footage of black-clad Israeli commandos descending from helicopters and attacking the activists, as well as several wounded people lying on the deck of the ship. However the Israeli army said the activists attacked soldiers with knifes, clubs and a rifle snatched from an Israeli commando, injuring four Israeli servicemen. Israel also termed the humanitarian aid by peace activists, a violent media provocation against the government of Israel. There were unconfirmed rumors that Sheikh Raed Salah, leader of the Islamic Movement in Israel, had been killed during the Israeli takeover of the boats. In Islamabad, politicians, lawmakers and journalists staged a peaceful protest against Israel, denouncing the killings and calling on the United Nations and the United States to intervene. Countrywide rallies were also held where common people also participated with the journalists, condemning the Israeli attack and demanding the release Pakistani journalists. The fate of three Pakistanis, Talat Hussain, Agha Raza (Both of Aaj TV) and Mr. Nadeem is still uncertain after a Gaza-bound aid flotilla they were travelling on was attacked by the Israeli Navy. Prime Minister Yousuf Raza Gilani “strongly condemned” the attack on the “peaceful flotilla,” his office said. Foreign Minister Shah Mehmood Qureshi said Pakistan was trying to find out whether any of the Pakistanis who were with the flotilla had been affected. The government said, it was “seriously concerned over the well-being and whereabouts” of Pakistani citizens and media personnel on board. Owing to no diplomatic relations between Israel and Pakistan, Pakistan has started contacting OIC, UN and International Red Cross to lodge protests against Israeli attack and to inquire the whereabouts of three Pakistanis on the freedom flotilla. The Turkish government “strongly protested” against the military action in international waters, calling the interception unacceptable. “Israel will have to endure the consequences of this behaviour, “a Turkish foreign ministry statement said. Turkey has also reportedly recalled his ambassador to Israel and has demanded to hold emergency meeting of UN Security Council. Around 10,000 Turkish protestors marched from the Israeli consulate in Istanbul towards the city’s main square on Monday, shouting slogans and waving banners saying “Killer Israel”. World seems to be in a state of shock on Israel’s storming of a Gaza-bound aid flotilla which set off an international furor, also drawing criticism from friends and enemies alike. – Turkey, Germany, France Lead Condemnation of Israeli ship raid. – Turkey warned Israel of ‘irreparable consequences’ to bilateral ties and has recalled his ambassador to Israel and demands to hold emergency meeting of UN Security Council. – France’s foreign minister said he was “profoundly shocked” by the violence. – Palestinian President Mahmoud Abbas described the killings as a massacre. – Iran, one of Israel’s biggest foes in the Muslim world, said the killings were “inhuman” and would help lead to the Jewish state’s demise. – Arab League calls Israel’s raid a “Terrorist Act” and called for an emergency meeting on Israel’s attack on aid flotilla. – Greece’s National Defense Ministry called off a joint air force exercise with Israel after the news. Enough has been said and expressed through the use of words but it is high time now to take some timely action to save the rest of the lives for the sake of each country’s own honour and integrity if not humanity. Frustrated with Facebook’s lack of privacy and biased policies, few techies have launched Pakistan’s first social network, MillatFacebook. The private venture came after a Pakistani court ordered a block on Facebook until May 31, following deep offence over an “Everyone Draw Mohammed Day” page considered “blasphemous” and “sacrilegious”. “Millatfacebook is Pakistan’s very own, first social networking site. A site for Muslims by Muslims where sweet people of other religions are also welcome,” the website tells people interested in signing up. The Urdu word “Millat” is used by Muslims to refer to their nation. The website claims to have attracted 4,300 members in the last three days — mostly English-speaking Pakistanis in their 20s. Barsega Saawan, Barsega Saawan Jhoom Jhoom ke..